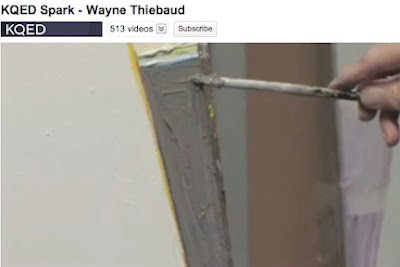 Wayne Thiebaud, whose paintings and teaching have influenced an untold number of painters; who began teaching at U.C. 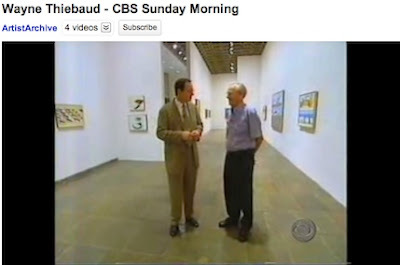 Davis in 1960, and continues to teach there once a year though he is nearing ninety; and whose thoughtfulness, wisdom, love of painting, and endearing modesty shine through in his interviews, is profiled in these three videos. Thiebaud first became known for his paintings of pastries – of rows of cakes and pie slices, but he has also painted series of still lifes (such as lipsticks), portraits, San Francisco cityscapes, and Sacramento Delta landscapes. 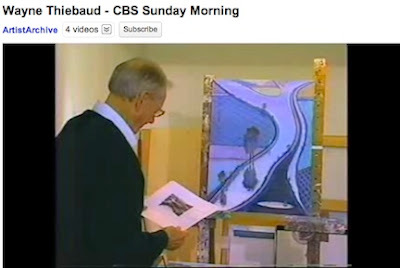 Wayne Thiebaud - CBS Sunday Morning gives a good sense of how Thiebaud never felt his success was predestined – and how hard he worked to get people to look at his paintings – as well as a good overview of his life and work. He says in it, "If we don't have a sense of humor, we lack a sense of perspective." His good humor is clearly evident. As the interviewer says, "His voluptuous oils look like buttercream on canvas. You don't just want to look at his pictures, one critic said, you want to lick them." 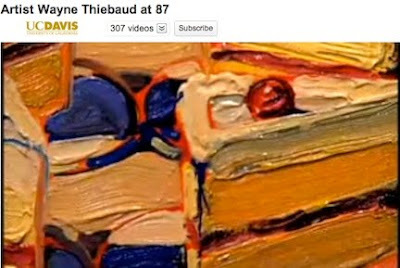 Artist Wayne Thiebaud at 87, a U.C. 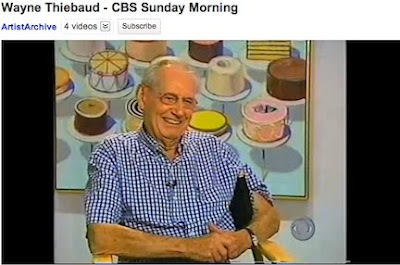 Davis video, presents interviews with Thiebaud, his colleagues, and his friends. Here, he says about painting, "It is pain and pleasure. Matisse says the best thing when he says, work is a paradise, but you have to know how to enter that paradise." 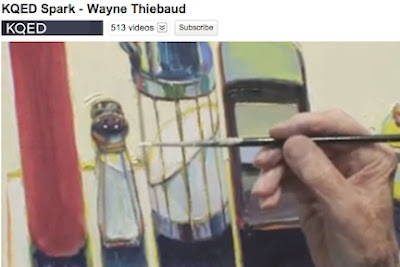 In KQED Spark – Wayne Thiebaud, the painter describes his process, saying, "So a lot of the work depends on problems. It can be a problem of color, a problem of light, a problem of space. Painting really can be a kind of miracle, 'cause it's a totally unnatural act. It ain't natural to make three dimensions on a two dimensional surface. It's strange – but wonderful." "The movements in the picture needs to be there. The sequence of light needs to be considered. Have you included various kinds of light? Have you included, let's say, glints, gleam, glow, so that the light is like the life of light in its range. If it doesn't have a lot of this visual experience, then we run the risk of boring people." "In a way, what keeps you going is the thrill of experimentation and expectation. That's what you do as a painter – you live on hope... that next picture." Wayne Thiebaud's work can be seen until July 3rd, 2010, at the San Jose Museum of Art, in the show Wayne Thiebaud – Seventy Years of Painting. The talk he is scheduled to give April 1st has been sold out for over a month, but the museum plans to videotape it. 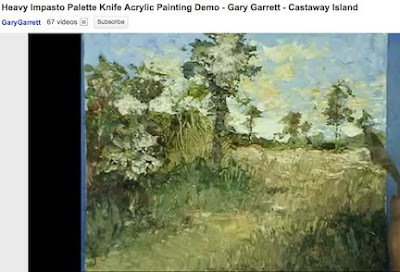 Painter Gary Garrett demonstrates palette knife painting in this short YouTube video, Heavy Impasto Palette Knife Acrylic Painting Demo - Gary Garrett - Castaway Island. Working in the studio from a photograph, on an 8" x 10" surface, he used two palette knives (and a razor for scratching into the paint) and mixed his paints with a heavy gloss gel medium to create this piece. 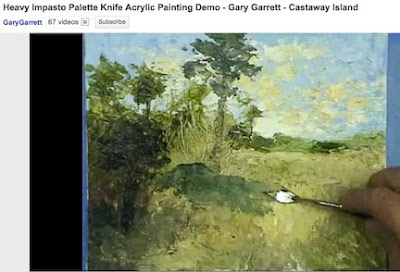 Garrett comments on the process, "This technique sacrifices fine details for a more impressionist style of applying the paint. There's a real FREEDOM in not being concerned about details." The entire painting took him one hour and eight minutes to paint. Palette knife work goes quickly! 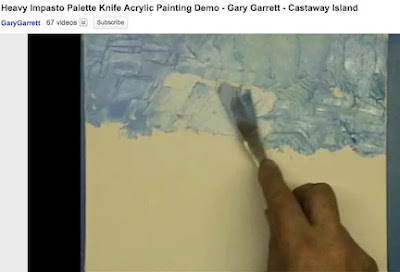 In answer to a question about the differences between large and small palette knives, Garrett wrote, "The larger knives are relatively more flexible as the steel is the same be it a small or large knife. When I paint with the small knives, I tend to paint with the tip only and then draw the knife down and away. It takes a bit of planning, but can be very rewarding." When asked as to his preferences of palette knives, although he has a variety of shapes and sizes from different makers, Garrett keeps coming back to the Loew Cornell J-0 and J-11 palette knives, although he has a variety of shapes and sizes from different makers. open to students in both Wednesday and Friday classes! Dan Dinneane, a fellow painter in both the Wednesday and Friday classes, has invited us to paint on his ranch, in a beautiful spot with a spectacular view of the Palisades. Wednesday's class will meet there at 1:00 rather than at the Art Center. 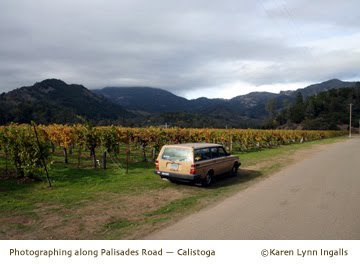 It's not too far from this spot I photographed last fall, on Palisades Road. There is plenty of shade, but be sure to bring a hat if you want to be in the sun. You will also need to bring drinking water, as well as your regular painting materials, including an easel if you have one. Be sure to bring a camera to take reference photos for later, too! As a special treat, there is a possibility that a friend of Dan's, the painter Wade Hoefer, may come to meet and talk with us. You can see his website at www.wadehoefer.com. His work is wonderful – subtle, luminous visions – of a kind of archetypal landscape. Please take a look at it, and think of what questions you may want to ask him, if he is able to join us. The address is 3003 Lake County Highway (also known as Hwy #29 North). It is about one mile north of the intersection of Silverado Trail and Lincoln Avenue, just across from Palisades Road. 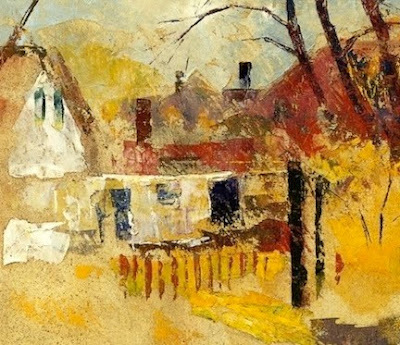 Look for a yellow farmhouse. Call me (942-0197) to find out how to get in the gate. Once you're inside, please park at the left of the driveway, not at the estate. If you talk with anyone else from the classes between now and then, could you make sure they know about it, and see if they will be able to join us? The Friday class will meet on Friday at the Art Center as usual – this is an extra treat, if you are able to come! 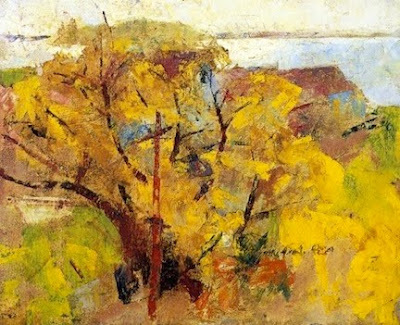 Charles W. Hawthorne (1872 – 1930) was an influential American painter and teacher. 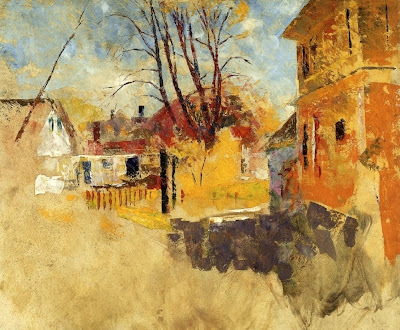 In 1899 he opened the Cape Cod School of Art in Provincetown, Massachusetts, which became an important American art school, and where each summer he taught plein air painting. 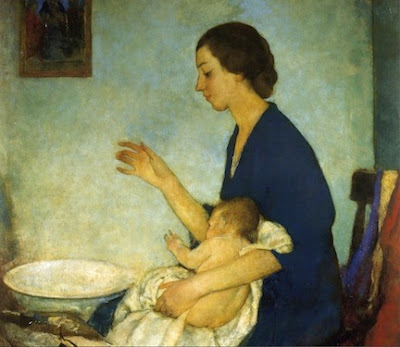 Some of his paintings from the nineteen-teens were lovely, luminous portraits using a lot of scumbling, such as you can see in these details of The Bath – Portrait of Emelyn Nickerson with Baby, from 1915. Many of these are portraits of common people, often doing ordinary things – not society portraits. In some portraits from this time you do see lines looking as though they were created with a palette or painting knife. But by the 1920s, Hawthorne was using palette and painting knives to a much greater extent. Because of his influence as a teacher, he popularized their use. 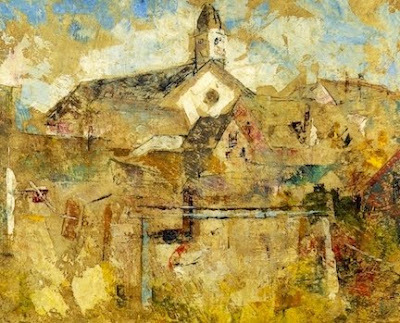 Here you can see how he used palette and painting knives to paint White Church; Town View, Provincetown; and Willows, all circa 1920. Notice the broad, flat strokes of white for the building, and the wide, dark strokes of a fence below, contrasted with the narrow reddish fence posts and lines of the trees and tree branches, all looking distinctly un-brushy? Notice the interesting texture and feeling of spontaneity? Painting and palette knives can allow you to paint more quickly and spontaneoudly. There is a local-ish connection here, too. Noted colorist Camille Przewodek, who lives in neighboring Sonoma County, studied with Henry Hensche, who was a student of and assistant to Hawthorne, and who continued teaching in Provincetown after Hawthorne's death. 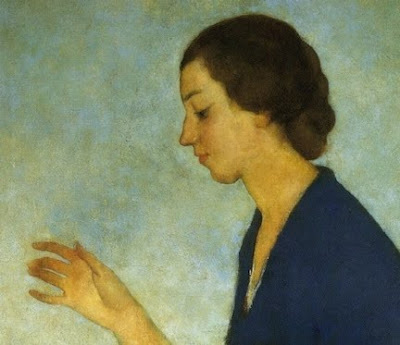 Although it may be tough to see a connection with these paintings, it is clearer when you see the colors Hawthorne began using later in the 20's. You can see more of Hawthorne's work here, at www.the-athenaeum.org. 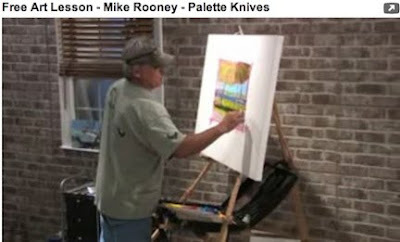 Mike Rooney gives a great lesson on painting with a painting (or palette) knife in the video Free Art Lesson – Mike Rooney – Palette Knives. 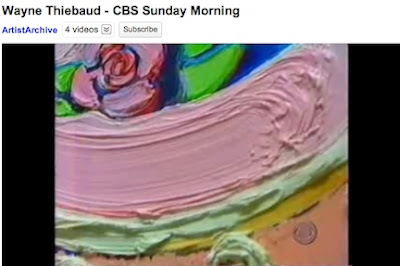 Notice how the painting is underpainted in magenta (effective under the greens he will be painting over it)? For this demonstration, he starts with the painting already blocked in, so that you see the abstract shapes of the landscape. When you mix your paints for painting with a knife, you don't have to mix them completely. He points out that, when you apply them with a knife, the unmixed colors can create a kind of marbleized effect. You get the color straight from the palette – unlike the brush, which picks up color from your paint water. Here he uses the knife to bring color into the negative spaces surrounding the trees. He sets the palette knife along the edge he wants to begin at, and moves the paint across the space to be painted. He recommends that you not paint all the way up to the edge of the other shape. 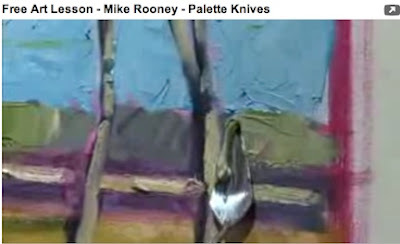 You can see more of Mike Rooney's work at www.mikerooneystudios.com and read his blog at http://mikerooneystudios.blogspot.com. "Painterliness" refers to a quality of brush strokes, in which the brush strokes are highly visible, often looking thicker and tactile. It is contrasted with painting that is more linear, with a highly modeled, more controlled use of form, in which you don't see the brush strokes. 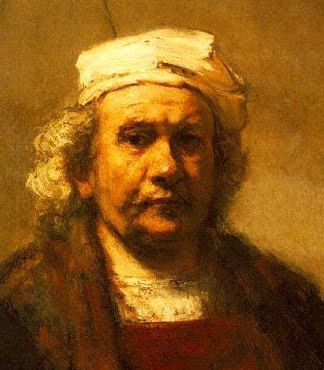 Rembrandt's work, especially his later work, was painterly (see the roughness? 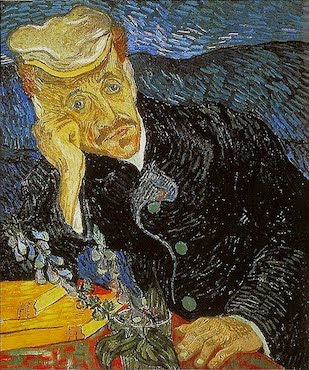 the obvious brush strokes in this detail of a self portrait? ); Vermeer's was not. 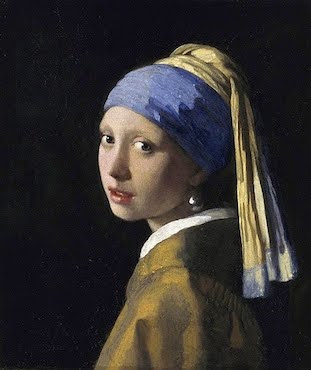 In Vermeer's paintings it is often difficult to see the stroke of the brush at all. Van Gogh's work was painterly – the brush strokes here are even more obvious, and an important part of the painting as a whole. 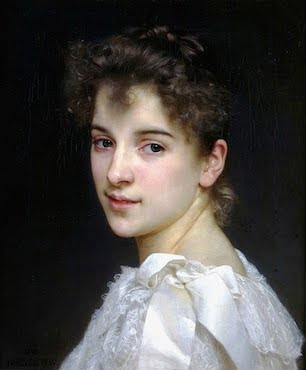 French academic painter William-Adolphe Bouguereau's work was not – his intention was to eliminate the brush strokes and give the appearance of what we would now call photo-realism. One method is not better than the other – they are simply different ways to approach the process of painting. You can find out more about the origins of the term and the idea of painterliness here, at Wikipedia. Chilean landscape painter Alex Perez, perezarte on YouTube.com, made a series of videos of his painting process, forming a master class. They are particularly wonderful for studying his mastery of brush strokes. He explains the variety of brush strokes he uses as the painting progresses – each stage of the painting having different needs. Each video runs between seven and ten minutes, so watching them all takes a chunk of time, worth it if you are able to do so. He is very generous with his explanations and demonstrations of different kinds of brush strokes, the palette he uses, his compositional decisions, and everything else associated with the process of the painting. 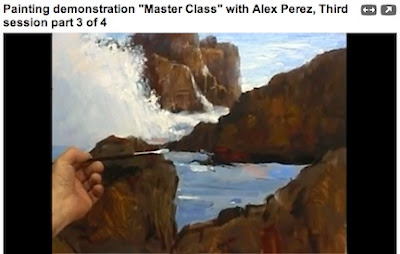 If you only have a little time, be sure to watch Painting demonstration "Master Class" with Alex Perez, Third session part 3 of 4 – the painting is about halfway to two-thirds of the way toward completion, and here we really see the mastery of Perez's brush strokes, and the way he dances them across the canvas. 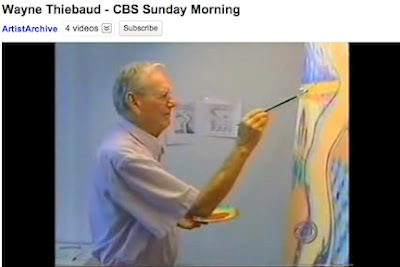 Notice how he holds his brush, often turning his hand backwards (see the image above), saying, "Remember the trick that I use, with the side, with the back of the hair, to give this sensation, this effect of falling water...."
If you are beginning as a painter, it's important to remember that this is one of the later videos in the process, preceded by working out the composition and blocking in the big shapes. Here, in a still image from Painting demonstration Master class with Alex Perez, painting session 2, Part 3 0f 3, you can see how he has drawn the basic composition, and is now blocking in the big shapes. Taped to the easel shelf you can see the photo he took and cropped to the size of the canvas. 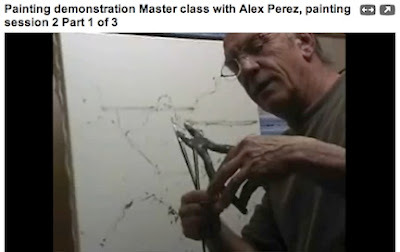 If you have a little more time, and want to particularly focus on brush strokes, I'd next watch Painting demonstration "Master Class" with Alex Perez, Third session part 2 of 4, Perez demonstrates how his customized filberts allow him to create beautiful dancing strokes. He also discusses his palette, which is something like an expanded historical palette. Remember that he uses oil paints, which give him much longer drying times than we have with acrylics. You can get that longer drying time by either adding retarder or slow drying medium to your acrylic paints, or by using Golden's Open Acrylics, which have a three to four day drying time. He is clear that what he is doing at this point is still "nothing in detail – only, the second coat, play with colors, lighting, shadows...."
Painter Alex Perez with the completed painting, "Las Salinas beach rocks"
In Master class, painting demonstration by Alex Perez, "the final session," Perez gives the final touches of color and light, demonstrating more of the sensitivity to the brush strokes that we saw in the earlier videos. If you have more time, or are able to come back to it later, in Painting demonstration Master class with Alex Perez, painting session 2, Part 1 0f 3, he shows how he alters his brushes, making customized filbert shapes out of round brushes, so as to get the right shapes and flexibility to his brush strokes. If you are dissatisfied with any of your brushes, you might consider trying something of the sort – although you might try it first on inexpensive or very old, worn-out brushes to experiment. 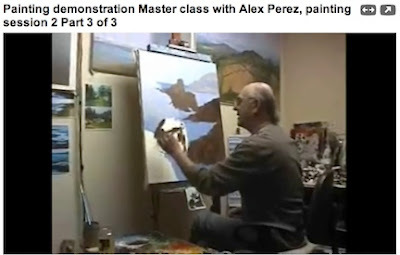 To return to an earlier stage, in which Perez uses another kind of brush stroke, in Master Class with Alex Perez, Third Session - Part 1 of 3, he has completed blocking in the big shapes of color, and is refining the shapes further, coming in with more complex colors. "So I use a kind of broken, short brush strokes, to give, as I say before, much interesting... shapes." 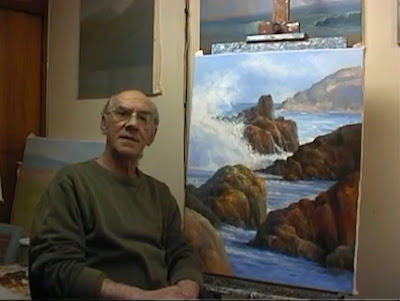 He continues to explain and demonstrate clearly how he blends the brush strokes, changing from short, choppier strokes to a smoothing, rhythmic stroke with a clean brush, followed by a kind of caressing stroke, as he blends in new areas of color and smooths the edges of the cloud and sky shapes. "One of the most important things is to give rhythm – the rhythm of the brush strokes, the rhythm of the composition," he says. It is a treat to watch the rhythm of his brush strokes as he paints. You can view his website at http://www.a-perez.com and his blog at http://perezart.blogspot.com. 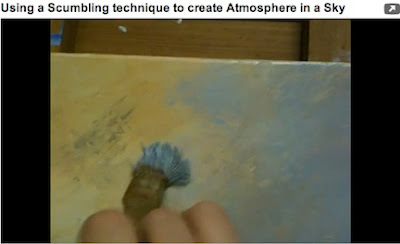 Using a scumbling technique to create atmosphere in a sky is a helpful video demonstration of scumbling by painter Jan Blencowe, with clear explanation and instruction. 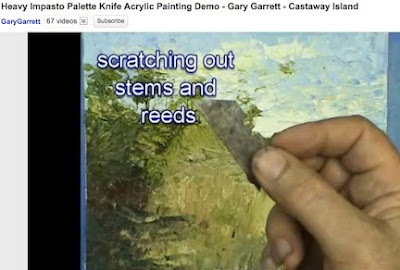 In this demonstration, she uses a short-handled bristle brush from a hardware store, and shows clearly how she gets paint off the brush before working on the canvas, leaving a nice, dry brush. She applies the paint with a circular, scrubby stroke, creating a kind of veil of color over the color underneath, and giving a lovely atmospheric feeling to the sky in this painting. You can also find Jan Blencowe's work on her website at www.janblencowe.com and on her blog at www.thepaintingadayproject.com.